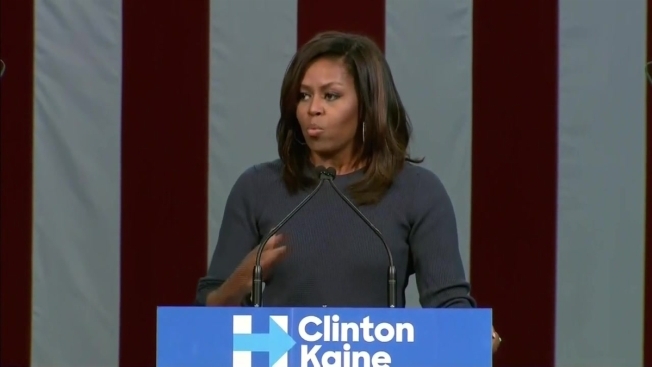 Obama said Trump's controversial comments about women were "cruel" and should not be dismissed as "locker room behavior"
First lady Michelle Obama slammed Republican presidential nominee Donald Trump in a campaign speech for Hillary Clinton in New Hampshire Thursday, saying his controversial comments about women were "cruel" and should not be dismissed as "locker room banter." "This is not something we can ignore, not something we can sweep under the rug," Obama said, referring to a vulgar conversation Trump had with former "Access Hollywood" host Billy Bush in 2005. "This has shaken me to my core in a way I could not have predicted," the first lady said of Trump's words. Later, President Barack Obama joined in the anti-Trump rhetoric, ridiculing the Republican party at a Democratic rally in Columbus, Ohio, for standing by Trump through many other scandals. "They've been riding this tiger for a long time. They've been feeding their base all kinds of crazy for years," the president said. He compared party members coming out against Trump's remarks for women to the character from the classic movie "Casablanca" who is "shocked that there is gambling in this establishment." Obama also had kind words for his wife's speech, saying marrying Michelle is an example of getting married to "improve your gene pool." "The idea you can do anything you want to a woman, it is cruel," she said. "It is frightening." Michelle Obama also made passing reference to a number of women who came forward by Wednesday night to accuse Trump of inappropriate sexual behavior, as evidence the tape is not an isolated incident. Trump has fervently denied he acted inappropriately toward any of the women who came forward. "Now is the time for all of us to stand up and say enough is enough,” she said. "This has got to stop right now." While she didn't mention her husband, she said Trump's comments did not reflect how the men in her family discuss women. "I can tell you the men in my life do not talk about women like this. I know my family is not unusual," she said adding, "they are loving fathers who are sickened by the thought of their daughters being exposed to this kind of vicious language about women." Clinton's daughter, Chelsea Clinton, also campaigned for her mother in Maine and Massachusetts on Thursday. "Access Hollywood" is owned and distributed by NBCUniversal, the parent company of NBC News, MSNBC and this station.